Birds are singing, love is in the air, and Valentine’s Day is around the corner. Grocery stores are building ever-higher stockpiles of chocolate and florists are becoming particularly fragrant. 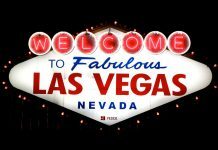 There’s just one little snag—while gifts of postcards and flowers are as appreciated as ever, it’s 2019, and you’d be hard-pressed to find a significant other who wouldn’t be bowled over by a new phone, laptop, or perhaps some PC components. Picking out such a gift out can be tricky, especially if you don’t have the lay of the land, but we’re here to lend a helping hand. Here at ASUS, we’ve got gifts suitable for everyone from PC enthusiasts to snap-happy smartphone addicts. We’ve selected the choicest bits of kit for the ultimate Valentine’s shopping guide. A number of items have associated deals that’ll run out after V-day, while others will stick around a bit longer at discounted prices. That’ll help you save precious cash that can be redirected towards the acquisition of more chocolate. Read on for our top picks this Valentine’s Day. You might even find something for yourself! Ask anyone what their priorities are when picking out a phone, and chances are they’ll tell you they want a fantastic camera and a big display. Those two characteristics are the centerpieces of the ZenFone 5Z. A bright 6.2″, 2246 x 1080 display covers 90% of the handset’s face. Stills and videos appear lifelike thanks to the screen’s cinema-like 100% DCI-P3 color reproduction, and all those pixels are safely encased behind a sheet of Gorilla Glass that’ll easily resist scratches and drops. Around back, a dual-camera setup with twin 12MP sensors captures awesome photos, even in low light, and is backed by an AI brain that can identify what you’re looking at and choose the best mode automatically. Your videos will be as sharp and smooth as ever, too, thanks to the ZenFone 5Z’s ability to record 4K video at a full 60 FPS with three-axis image stabilization. Inside the gorgeous metal-and-glass chassis sits a mighty Qualcomm Snapdragon 845 chip with eight cores ticking away and talking to 6GB of RAM. All that horsepower is ready to run the latest apps and demanding games. The Snapdragon chip’s silicon is the brains behind many of the ZenFone 5Z’s intelligent features, like the camera’s automatic scene detection and the clever sensor array that knows when you’re reading a long article and won’t shut the screen off. 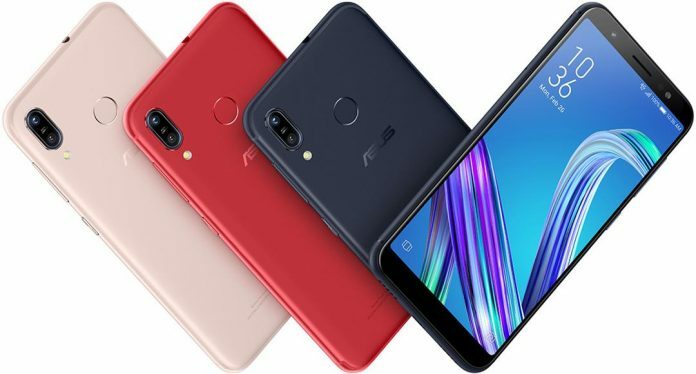 It’s not uncommon for flagships of this caliber to cost close to a grand, but ASUS has your back—the ZenFone 5Z packs all the trimmings of a high-end phone at mid-range price. Check the table below for retailers selling the ZenFone 5Z in North America. It’s priced at $499 USD and $799 CAD. You can read more about it in our hands-on article. Charge your phone, browse, play, plug-in, repeat. That modern-day cycle can get a little old at times, but it beats having your phone die before you’ve even had a change to say goodnight. The ZenFone Max M1 is for the couples who can’t bear to be away from each other. This budget handset has a dual rear-camera setup and a particularly impressive party trick thanks to its capacious 4,000 mAh battery. That phone will last you 23 hours while browsing the web, let you talk for 36 hours, or even sit for up to a month on 4G standby. Around the back, there’s a dual-camera setup with a 13MP main camera and a secondary 120° wide-angle lens that’s perfect for panoramic shots and landscapes. 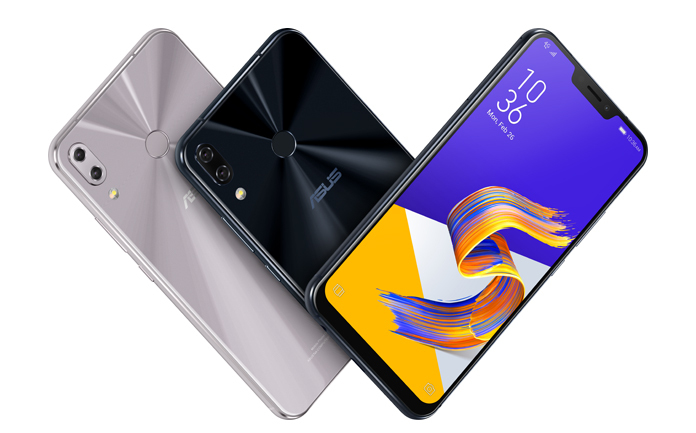 Although the ZenFone Max M1 has a 5.5″ display, its narrows bezels means the metal chassis is smaller than you’d expect and easy to hold in one hand. A Qualcomm Snapdragon 425 SoC is the brains of the operation, and the triple-card tray will let you use two SIM cards in tandem with a microSD memory card. Such a big battery would be useless if it couldn’t be juiced up quickly, which is why the ZenFone Max M1 has 10W fast-charging support that’ll bring it from zero to 100% capacity in only three hours. The ZenFone Max M1 is priced at $169 USD and $229 CAD. Check the table below for retailers in your region. 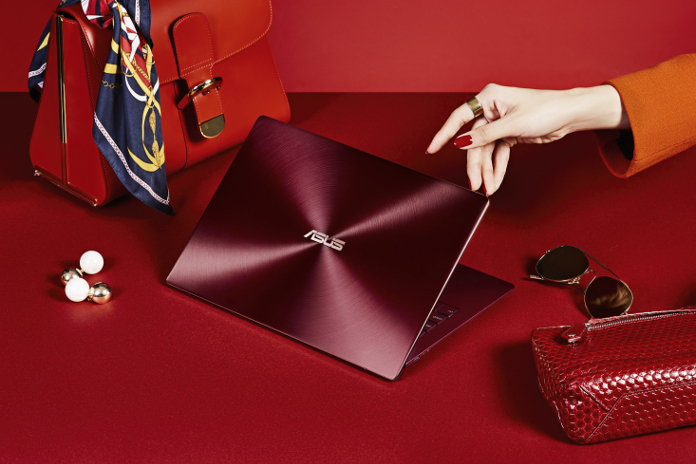 Red is the color of Valentine’s Day, and it’s also the boldest shade for one of our best ultrabooks yet, the ZenBook S UX391. The brushed aluminum design with Rose Gold trim turns more than a few heads, as does the ErgoLift hinge that props the keyboard up at an angle to improve cooling and provide a more comfortable typing position. While we’re talking ergonomics, you should know that the ZenBook S has been hitting the gym—it weighs only 2.2 lbs and measures a mere 12.9 mm thick. The all-metal unibody chassis encloses a colorful 13.3” display with up to 4K resolution, wrapped in slim 5.9 mm bezels, and with optional 10-point touch support. You can even draw on it with the optional ASUS Pen. If you prefer more traditional input, we’ve redesigned the keyboard switches for this model for an extra-crisp typing experience, and its backlighting glows a subtle shade of gold. Deep in the machine, an Intel Core i7-8550U processor and 8GB of RAM are ready for any demanding task, while your data is safely tucked away in a super-fast 256GB NVMe solid-state drive. Should you need to plug in high-end peripherals, two Thunderbolt 3 ports and an additional USB Type-C connector stand ready. The ZenBook S UX391 is available in Burgundy Red for $1,199 USD. You can find it at the retailers listed in the drop down below. Stepping up in size a little is the Zenbook 14 UX433FA. Its centerpiece is a 14” NanoEdge display with barely a hint of bezel. A 4-way NanoEdge display is squeezed into a chassis roughly the size of an A4 sheet of paper thanks to bezels that measure just 2.9 mm on either side. Despite its roomy display, the ZenBook 14 is still incredibly portable. It measures 15.9 mm thick and tips the scales at 2.6 lbs, so it can go wherever you go. The ErgoLift raises the keyboard for easier typing and improved airflow. The backlit keyboard has 1.4 mm of key travel for typo-free typing, while the dual-function touchpad pulls double duty as a dedicated numeric pad. 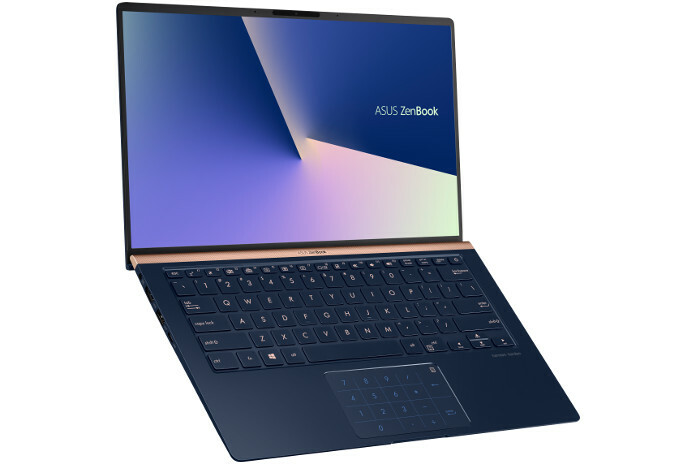 The upgraded ZenBook 14 boasts up to an Intel Core i7-8565U, up to 16 GB of RAM, and can be configured with a PCIe SSD up to 512GB in size. There’s connectivity options aplenty on this machine, too. With three USB ports in both Type-A and Type-C flavors, an HDMI output, and Bluetooth 5.0, you can leave your dongles at home for true no-strings-attached productivity, and the 2×2 802.11ac WiFi connectivity that can hit speeds as high as 1734 Mbps. Who needs wires anyway? 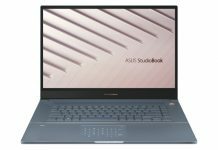 Find the ZenBook 14 UX433FA priced at $1,199 USD and $1,499 CAD at the retailers listed in the table below. Gone are the days when Chromebooks were just for browsing the web and not much else. Chromebooks are more capable than ever, and if ever there was a laptop for which the keywords are “simple” and “practical,” it has to be the Chromebook C523. 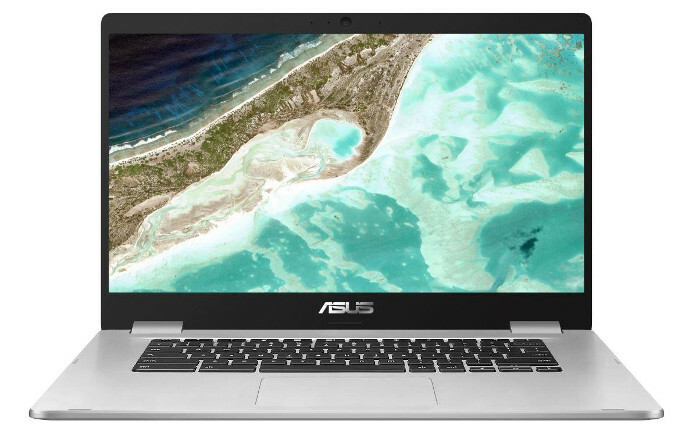 While lesser Chromebooks may be endowed with meager computing resources, the C523 packs a quad-core Intel Pentium N4200 chip and 4GB of system memory, so you can hop between endless Chrome windows and your favorite apps with ease. Powered by Google’s Chrome OS, it comes with support for the Play Store out of the box to expand functionality beyond what’s available in the Chrome Store, and its 10-hour battery means you can leave your charger at home when you set out for the day. The display measures 15.6” across—bigger than in most other Chromebooks—and the thin bezels mean the entire machine is compact. A 180° hinge offers wider range of motion, even letting you lay the screen down flat, which is handy when you want to share the view with others. We made sure the hinge is good for 20,000 open-and-close cycles so it won’t loosen up over time, either. Though the Chromebook C523 rings in at less than three hundred bucks we didn’t skimp on the details that matter most. Like with our high-end ZenBooks, the keyboard atop the Chromebook C523 has 1.4 mm of key travel for comfortable typing. The whole thing is wrapped in a sleek silver chassis with a metal lid that offers a premium feel. The two USB Type-C ports and dual-band 802.11ac WiFi are additional amenities not commonly found in Chromebooks, and they’re joined by two USB 3.1 Type-A ports for external storage. The Chromebook C523 starts at $269 USD and $349 CAD. Check the table below to find one at retailers in North America. While Chromebooks are designed to make working from anywhere easy, Google’s Chrome OS is a lot more versatile than the lightweight laptops we tote with us for work. 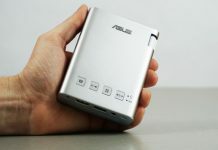 The web-based OS is the centerpiece of ASUS’s Chromebox 3, a diminutive machine that takes up next to no space and is a perfect alternative to a full-fledged desktop if you spend most of your time in the cloud. It’s no one-trick pony, though. The Chromebox 3 is just as appealing as an Android gaming console or even a home theater PC. Measuring in at 6” square, it takes up barely any space at all, and support for the Google Play Store means you can get your Android apps of choice rolling as soon as the machine’s running, too. While Chrome OS isn’t very demanding, similar devices often use under-powered chips that’ll choke and sputter when doing anything heavier than displaying the desktop. 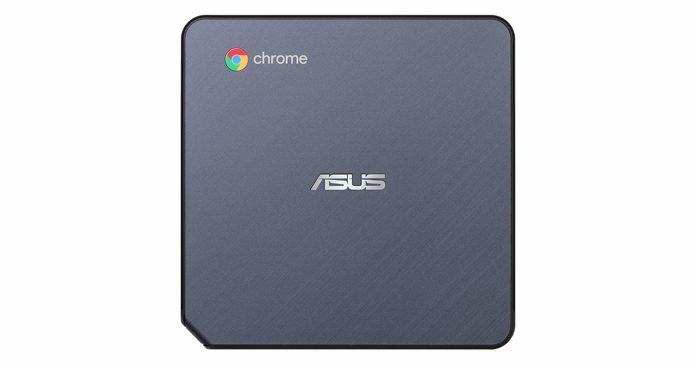 The ASUS Chromebox 3 uses Intel chips starting at a dual-core Celeron 3865U up to a powerful Core i7-8550U. The base spec model comes with 4GB of RAM, but the machine can take in as much as 16GB to easily juggle multiple apps at once. An HDMI port is on hand for hooking up to your monitor or TV, and for connecting peripherals, there’s a total of six USB ports (four at the back and two at the front) along with Bluetooth support. One of those USB ports is a reversible Type-C connector complete with Power Delivery and DisplayPort out, so it can be used for connecting a second display or even quickly topping up your phone or tablet. Built-in 802.11ac WiFi takes care of internet connectivity and shuffling data around, though there’s a Gigabit Ethernet port for times when the airwaves are too busy. Check out our hands-on article to read all about how to set up the Chromebox 3 in your living room. The Chromebox 3 is available in a range of configurations starting at $229 USD and $289 CAD. Shop the range using the table below. Real-time ray-traced computer graphics with realistic reflections and lighting have been “the next big thing” for the better part of three decades, but that time has come. NVIDIA’s RTX 20-series graphics cards finally delivered the goods, and now they’re ready to be taken for a ride inside ASUS and ROG’s RTX gaming laptops. From superpowered desktop-replacement machines to the Zephyrus ultrabooks, there’s an RTX-equipped portable for every style and wallet. Besides the latest crop of NVIDIA graphics cards, our RTX laptops carry powerful eighth-gen Intel Core CPUs. The displays received extra attention as well—our lineup includes options with slim-bezel 144Hz displays that really take advantage of the RTX cards’ massive output, as well as models with G-Sync technology that syncs up the graphics card and the display for buttery smoothness and reduced input lag. A laptop is much more than a CPU and a graphics, though. Our RTX family features fast NVMe SSDs, 802.11ac Wave 2 WiFi that can hit speeds well over a gigabit, and RGB LED lighting that can be customized and synchronized across devices with Aura Sync. The desktop-style keyboards offer extra-large space bars, quick actuation, anti-ghosting technology for accurate registration of multiple keys simultaneously, and some of the highest-end models have configurable per-key Aura Sync RGB backlighting. 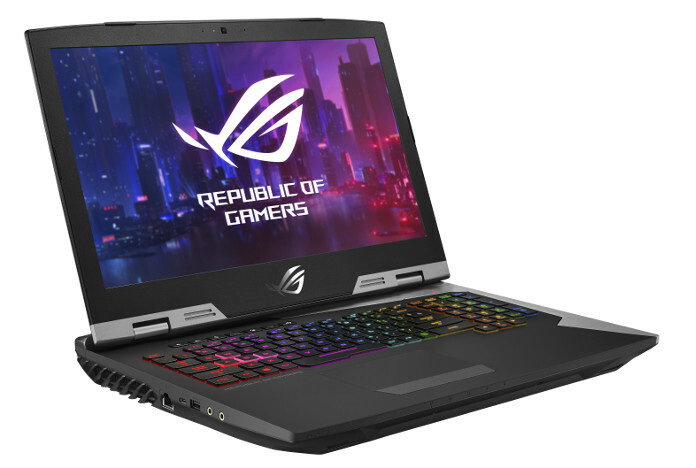 If you’re shopping for a desktop replacement as opposed to a laptop that can merely game on the go, the 17.3” ROG G703 is the answer. With up to an Intel Core i9-8950HK processor overclocked to 4.8GHz across all six of its cores, as well as GeForce RTX 2080 graphics, it’s a beast made for those who refuse to sacrifice performance, no matter where they’re playing. The G703 starts at $2.999.99 USD and $3,999.99 CAD, while the fully loaded model outlined here rings in at $3,999 USD. 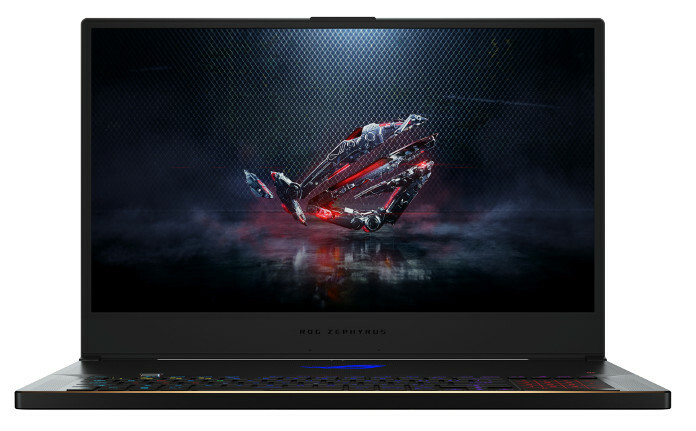 At the opposite end of the spectrum is the stunningly slim ROG Zephyrus S. Available in 17.3″ and 15.6″ flavours, the Zephyrus S line squeezes its powerful Intel Core i7-8750H CPU and up to a GeForce RTX 2080 GPU into impossibly thin forms that look more ultrabook than gaming laptop. The smaller Zephrys S GX531 measures just 15 mm thick, while the GX701’s 18.7-mm body snags the title for most compact 17″ gaming laptop ever. Both the GX701 and GX531 use our patented Active Aerodynamic System (AAS) to open up the back of the chassis for better airflow without compromising on performance. The Zephyrus S GX701 is priced at $3,299.99 USD and $4,299.00 CAD, while the Zephyrus GX531 (below) starts at $2,099.99 USD. Rounding out the family is our ROG Strix Scar II lineup and the ROG Strix Hero II. Designed for the mainstream gamer looking to balance portability and performance, the Scar II is available in two sizes and a range of configurations with up to GeForce RTX 2070 graphics. 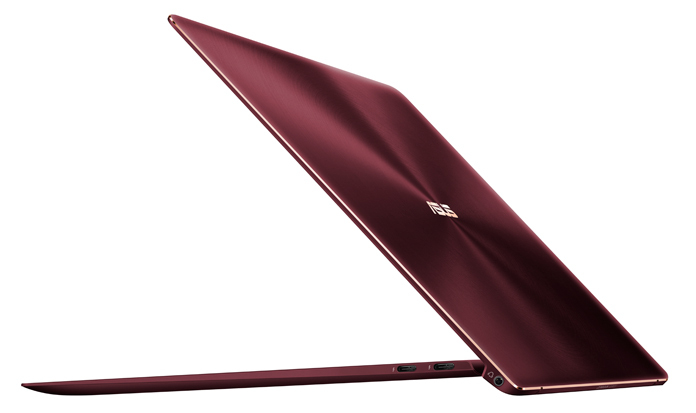 Whether you opt for the 15.6″ or 17.3″ Scar II, each one is loaded with an Intel Core i7-8750H CPU and 16GB of RAM. The WASD keys are highlighted so you can easily find the most important keys when playing FPS games, even if you’re in stealth mode with the 4-zone Aura Sync RGB backlight turned off. The Hero II features the same 15.6” 144Hz/3ms display as the smaller Scar but is designed for a different kind of gamer. Equipped with a GeForce RTX 2060 GPU, it can push premium performance in MOBA titles as well as a other popular games, though the highlighted QWER keys are a designation of its MOBA-inspired roots. 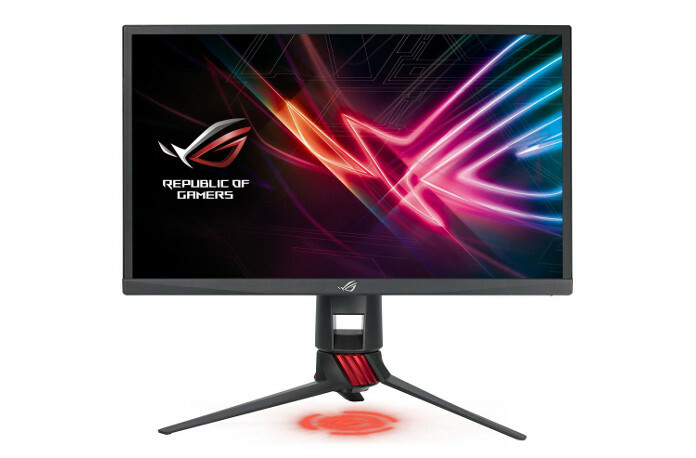 The ROG Strix Hero II starts at $1,799 USD or $2,299 CAD. The ROG Strix Scar II is available in a range of configurations starting at $1,799 USD and $2,299 CAD. Looking for the perfect RTX laptop for your sweetheart? Check out our dedicated GeForce RTX laptop guide for more on each model. If you already know which model you’re looking for, you’ll find retailers selling ROG RTX gaming laptops in the table below. 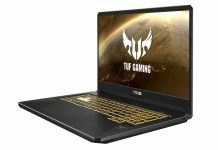 For gamers looking for an affordable machine that can deal with life on the road, the TUF Gaming FX505GD gaming laptop is the perfect fit. It has a reinforced chassis and has undergone MIL-STD-810G testing to ensure it can stand up to sudden knocks and jolts. Beneath its rugged exterior, the FX505 draws upon Intel’s eight-gen Core processors and can be equipped with up to the six-core, 12-thread Core i7-8750H. That’s paired with NVIDIA GeForce GTX 1050 graphics and 16GB of DDR4 memory. The 1TB FireCuda SSHD hybrid drive has enough space for all your games with quick access to frequently used files. Of course, raw power is nothing without speed, and the FX505 checks that box, too. It’s 15.6″ Full HD display uses a AHVA panel with a 144 Hz refresh rate for smooth, blur-free visuals and nary any input lag. It benefits from the same NanoEdge bezels as the ZenBooks for a more immersive gaming experience, too. 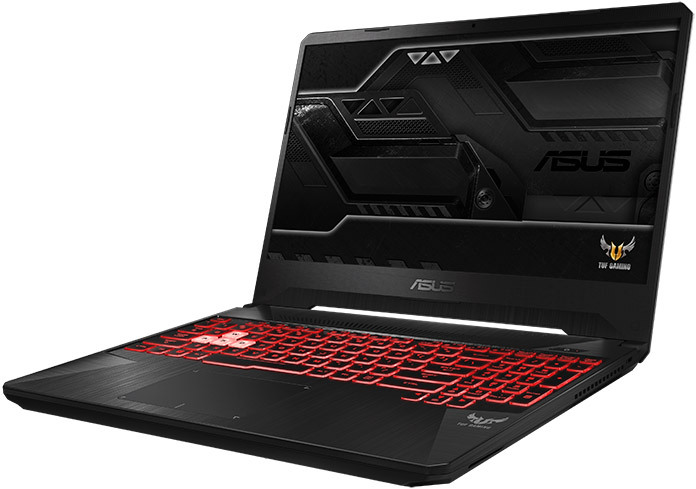 The backlit keyboard atop the chassis uses ASUS’s Overstroke technology for faster actuation, and in keeping with the TUF branding, each key is rated for 20 million presses. Comfy curved key caps and 1.8 mm of travel are the cherry on the cake. A full suite of ports are on hand if you want to plug in your favorite gaming mouse, and 802.11ac Wave 2 WiFi ensures you won’t lose connectivity in the middle of the action. The TUF Gaming FX505GD-WH71 is available for $1,099.99 USD in the United States. It’s time to get your ray-tracing on. NVIDIA’s flagship RTX graphics cards are here, and you can now enjoy your games faster than ever with realistic reflections and lighting. The Turing GPU brain inside them combines a traditional graphics chip with dedicated RT cores for ray tracing and Tensor cores for AI acceleration tasks. One of those tasks is NVIDIA’s Deep-Learning Super-Sampling (DLSS), a technology that lets you enjoy 4K gaming at higher-than-ever speeds by using clever AI-powered picture upsampling. Needless to say, these cards support G-Sync variable-refresh-tech, and the higher-end cards are also perfect for VR thanks to their raw performance and the presence of a dedicated VirtualLink headset connector along with dual HDMI 2.0b outputs. ASUS and ROG cards stand ready to put Turing to good use, starting with the mighty RTX 2080 Ti, the new king of the hill. The chip atop the card packs a whopping 4352 CUDA cores and ticks away at a 1545MHz stock boost clock, sitting next to 11GB of latest-gen GDDR6 memory on a 352-bit-wide path. Meanwhile, the second-in-command RTX 2080 drops down to “only” 2944 CUDA cores clocked higher at up to 1710MHz, sitting next to 8GB of RAM on a 256-bit bus. While all the talk these days is about the higher-end cards, the RTX 2070 and RTX 2060 deliver serious value to budget-conscious buyers. The RTX 2070 keeps the same 8GB of RAM as its sibling but employs 2304 CUDA cores ticking at up to 1710MHz. 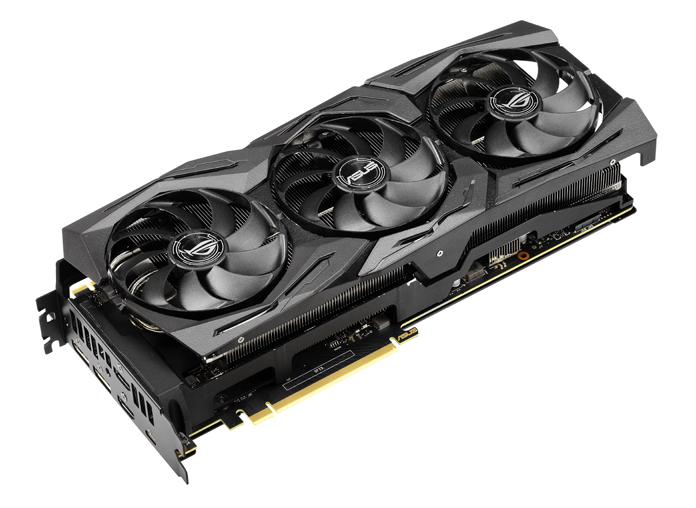 The RTX 2060 is one of the best mid-range cards you can buy right now, packing 1920 CUDA cores with a 1680MHz boost clock. The beefy coolers on our Strix cards have 20% more surface area than the previous iteration and use fans with larger blades that spin down when they’re not needed. Select models include FanConnect II headers to let users control case fans using the GPU (and also CPU) temperature. Underneath the cooler sit upgraded VRMs with solid polymer capacitors and alloy chokes to better handle the Turing chips’ appetite for power. A metal backplate and reinforced frame help keep the PCB straight, while Aura Sync RGB LEDs light up the backplate and shroud. You can turn the lights off at the touch of a button, too. The Dual cards, meanwhile, keep things simple and straightforward. Their massive 2.7-slot heatsinks use patented Wing-blade fans to chill the Turing chips underneath, and the cards are fastened to a metal backplate. Gamers with a preference for blower-style designs (say, for multi-card setups or Mini-ITX cases) will be happy with our Asus Turbo models. These use a cooler that’s reshaped to improve air intake when the blower is sitting next to case panels or adjacent cards. The large vents around the port cluster help exhaust hot air and keep the chip chillin’ throughout the day. You can shop the full range of RTX graphics cards from ASUS and ROG using the table below. Use the arrows to scroll for the full lineup. Intel’s Coffee Lake 8th and 9th Gen CPUs are quite the powerful beasts. The thing is, you don’t want to put a high-end chip on a motherboard with iffy power delivery, poor RAM support, and a barebones set of features. 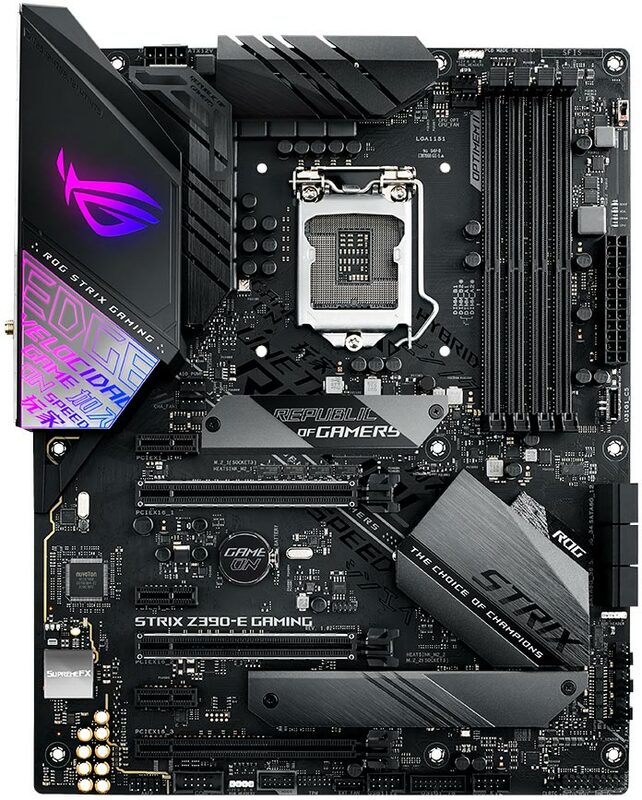 The ROG Strix Z390-series boards are a good home for your swanky new processor. Each model is clad in a stylish stealth aesthetic and boasts an integrated I/O shield. Common specs across the family include support for super-fast memory (up to at least 4266 MT/s), Aura Sync RGB lighting and connections for additional strips, dual M.2 slots, Intel networking chips, USB Type-C ports, and a SupremeFX S1220A audio codec with dual op-amps. Whew. The ROG Strix Z390-E Gaming and Z390-F Gaming are quite similar. These models include ROG’s bidirectional Node connector for external diagnostic devices, two headers for RGB LED strips, and one for addressable strips. The Z390-E has a bracket for mounting a VRM heatsink fan—a handy tool for overclockers who want to take their chips to the bleeding edge—as well as a front-panel Type-C connector, and extra network connectivity in the form Intel-powered 802.11ac 2×2 Wi-Fi with MIMO support for super-stable connections. In the bad old days, building a tiny terror-style rig in a Mini-ITX case meant you’d have to make compromises pretty much everywhere. With modern components like the ROG Strix Z390-I, though, compact builds owe little to their full-sized counterparts. This board includes nearly everything its full-size brethren do, save that there’s no back-panel USB Type-C port, and only a single PCIe x16 slot and four SATA ports due to the reduced real estate. However, the Z390-I also has a couple of neat tricks up its proverbial sleeve: 802.11ac 2×2 WiFi with MIMO, and even faster RAM support up to 4600 MT/s. If you’re looking to build a diminutive desktop that will smoke most full-size machines, the Z390-I is your friend. Last but by no means least, the ROG Strix Z390-H can best be described as an entry-level high-end motherboard. It’s dressed in a classic red-and-black motif and includes the vast majority of the accoutrements present on the Z390-E. Notable omissions include the back panel USB Type-C port (although there’s a respective front panel header), and external lighting support is limited to a single non-addressable strip. All told, this model delivers all the important goods without going overboard. The ROG Strix Z390 lineup starts at $189.99 USD or $246.99 CAD for the Strix Z390-H Gaming, while the ROG Strix Z390-I Gaming is priced at $214.99 USD or $279.99 CAD. 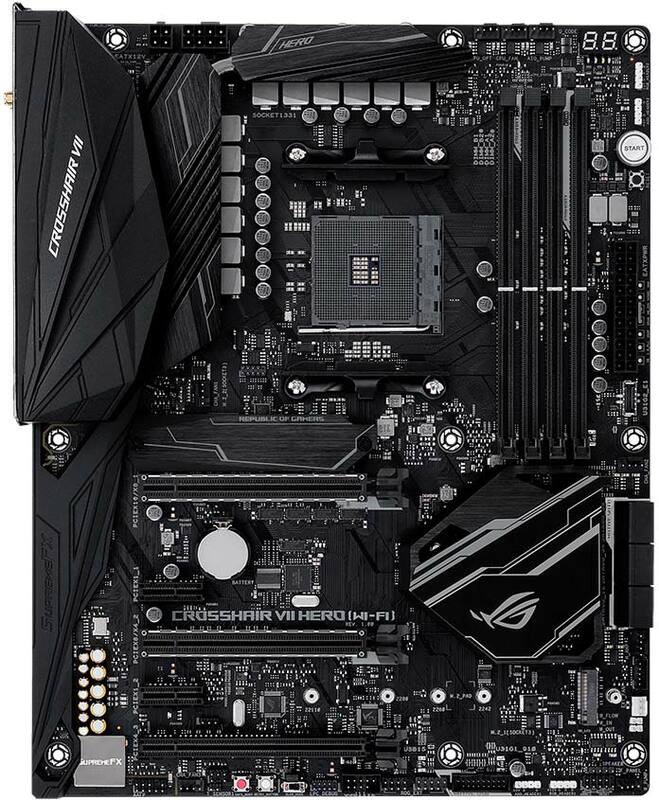 The top of the line Strix Z390-E Gaming motherboard is priced at $259.99 USD or $337.99 CAD. Check the table below to find a retailer stocking the board near you. If your significant other has a preference for AMD’s Ryzen processors, the ROG X470 Crosshair VII Hero motherboard stands ready for duty. The first things you’ll notice are the stealthy black looks with LED accents and the integrated I/O shield that lets builders avoid finger-slicing and fumbling during installation. Next, there are 12 (count’em) USB ports in the pack panel, including a USB 3.1 Type-C Gen2 connector. Those with a penchant for high-end cooling setups will be happy with the multiple onboard sensors, as well as the copious amount of fan headers, liquid-cooling control, and monitoring connectors. Gigabit Ethernet networking comes by way of an Intel controller (accept no substitutes! ), while an audio output section comprised of a SupremeFX S1220 codec chip, Nichicon capacitors, and a high-end ESS Sabre DAC ensure the best audio output this side of an overpriced audiophile setup. You can get your build’s lighting just right with the Crosshair VII Hero—set up the onboard RGB LEDs, external RGB strips, and addressable strips to your taste with Aura Sync, and color-match the lighting in your abode with Philips Hue support. 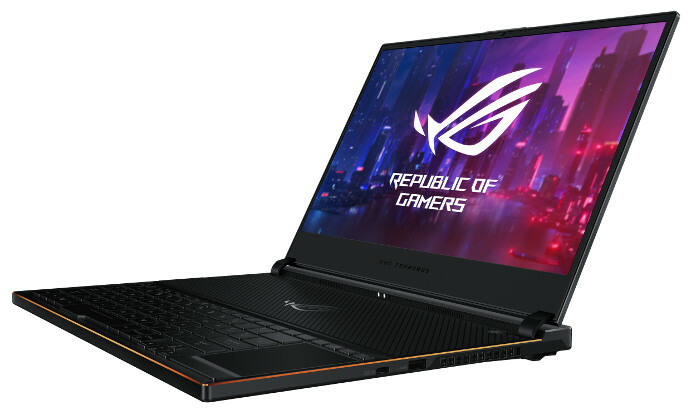 The ROG Crosshair VII Hero (Wi-Fi) is priced at $299.99 USD in the United States and $377.99 CAD in Canada. Use the buttons in the table below to find it at your favorite retailer. When it comes to picking out a gaming monitor, it’s easy to get lost during the selection process. Whether you’re after size, speed, or color, there are endless options, even within our own lineup, and it can be hard to choose the best one for you. The ROG Strix XG248Q is one of our favorites because it manages to check all of the boxes. Its 24” Full HD TN panel has narrow bezels that keep your focus on the action, and are ideal for multi-monitor setups. A blazing fast 240Hz native refresh rate and a 1-ms response time ensure help you stay on top of the action, no matter how frantic, and the XG248Q also has support for FreeSync and is G-Sync compatible to boot. That means you can get your graphics card to synchronize its frame output with the monitor for smooth, stutter-free visuals. Reduced input lag is an added bonus as well. The hard tech specs don’t tell the full story, though. 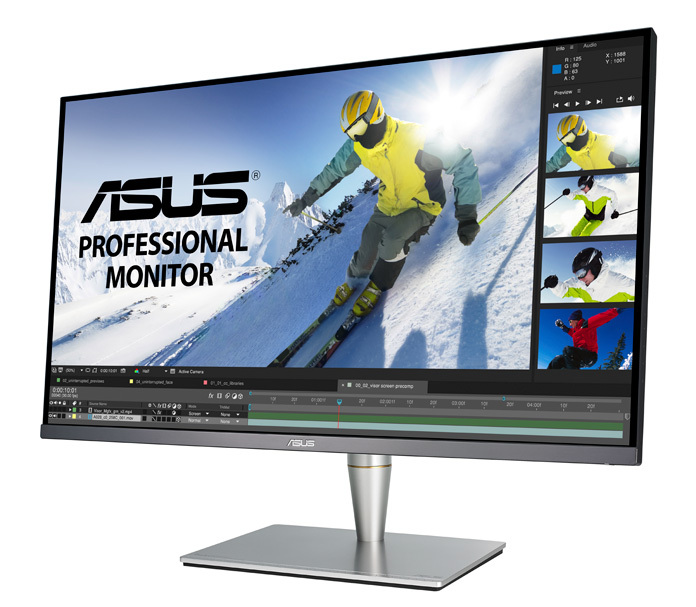 The XG248Q includes ASUS’s Extreme Low Motion Blur technology for smear- and motion blur-free visuals. Around the back, the XG248Q’s ergonomic stand provides height, tilt, swivel, and pivot adjustments, while an RGB LED light ring and styled casing ensure your setup looks good from any angle. Finally, a projector underneath the stand casts customizable lighting effects onto your desk for some added flair. The ROG Strix XG248Q is waiting to be wrapped up at the retailers in the table below. It’s priced at $349 USD and $459 CAD. While the XG248Q is a gamer’s dream, the ProArt PA32UC swings the opposite direction. This professional display is the perfect fit for color-critical work including video, photo editing, and 3D rendering. The extra-large 32” 4K UHD panel has a color gamut that covers 95% of the movie projection DCI-P3 color space, 99.5% of Adobe RGB, and 85% of the extra-wide Rec.2020 standard. As befits a modern-day pro monitor, there’s HDR10 support on tap and 384-zone local dimming. The display’s peak brightness sits at 1000 cd/m², while the contrast ratio in HDR mode is 20,000:1. Calibrating a display is a pain in the proverbial behind, so we calibrate every PA32UC at the factory up to a Delta E of less than 2. The accurate calibration is made possible thanks to the monitor’s 14-bit look-up-table (LUT) and its uniformity compensation feature. If you do need to tweak or recalibrate the PA32UC, ASUS ProArt calibration tech offers accurate tuning capabilities. Creative professionals have a variety of options for connecting the PA32UC to their devices thanks to the two Thunderbolt 3 USB-C ports (in and out for optional daisy-chaining), four HDMI 2.0b inputs, and a DisplayPort 1.2 connector. Additionally, there’s a built-in USB hub and a pair of 3W speakers. Get your hands on the stunning ProArt PA32UC for $1,999.99 USD. If there’s an often-overlooked piece of hardware that can easily ruin a gaming experience, it’s the mouse. Employing a rodent of poor upbringing is the fastest way to lose an online match or even hurt your mousing hand. The ROG Gladius II Origin’s shape was painstakingly designed to better fit multiple usage types: full-on palm grip, half-and-half claw style, and even fingertip grip. Comfortable rubberized sides prevent slippage during long gaming sessions, too. The ability to play your own way extends to the switches underneath the buttons. The Gladius II Origin comes fitted with Omron D2F switches rated for 50 million clicks, and it’s got a great customizability feature: you can open the mouse and easily swap out the switches. You even get a second set of Omron D2FC switches in the box that are firmer and have more travel than the stock D2Fs. A great mouse requires a great sensor, and the Gladius II Origin doesn’t disappoint. It uses a Pixart PMW3360 with 1:1 tracking and sensitivity up to 12,000 DPI. The braided cable is detachable for extra convenience when carrying the mouse around, and the Gladius ships with a spare PVC-coated cable you can keep in your bag. All this substance gets extra style in the form of three-zone Aura RGB LED lighting (mouse wheel, logo, and underside). The ROG Armoury II utility lets you fine-tune the mouse to your heart’s extent and set up handy macros to mop up the competition. 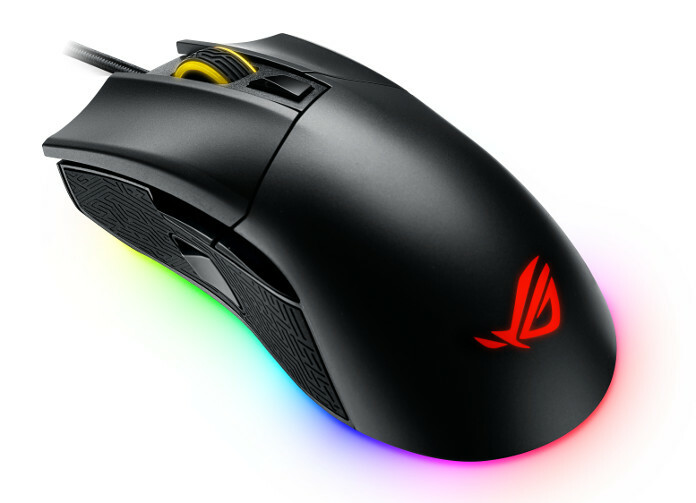 Grab the ROG Gladius II Origin for $99.99 USD or $129.99 CAD. You’ll find it at each of the retailers listed in the table below. The average home has seen an explosion of WiFi devices, from tablets and smart home gadgets to smart assistants. All of these devices are begging our routers for precious bandwidth, and while our need for connectivity was once confined to a few rooms, people want a stable connection from even the most remote corners of their house. The Lyra Voice is a 2-in-1 device that includes a high-end router and Alexa built-in to cover all your bases at once. The router core of the Lyra Voice is an 802.11ac unit with six antennas that’s capable of delivering an aggregate 2200 Mbps across three bands. That’s a sizable amount of radio waves good enough to fully cover most homes, but the Lyra Voice also includes support for ASUS AiMesh. That means you can combine it with other compatible AiMesh routers to extend wireless coverage to every nook and cranny, including across multiple floors and even the backyard. Amazon’s Alexa is the handiest roommate you can come across, and she’s right at home in the Lyra Voice. A pair of powerful speakers let you clearly hear what Alexa’s saying when she answers queries or commands. The speakers are also perfect for listening to music with bass reflex ports for extra punch. Support for DTS surround projects audio in a manner similar to a soundbar. 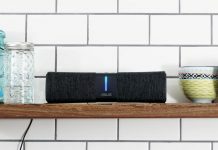 You can ask Alexa to play love songs for Valentine’s Day from a variety of music services including Spotify, Pandora, and Amazon Music. A common problem with networking gear is that it’s tricky to set up, and perhaps even more importantly, difficult to manage. You can easily set up the Lyra Voice with a smartphone app and keep an eye on devices’ internet usage. Additionally, our AiProtection Pro suite offers intrusion protection, malicious site blocking, and a host of additional security features—all without a subscription fee, unlike some competing products. You can rock their world with the Lyra Voice for just $219.99 USD. Check the table below for retailers near you. As every tech enthusiast knows, each and every device that’s visible in your home has an unofficial spec called the Spouse Acceptance Factor (SAF). 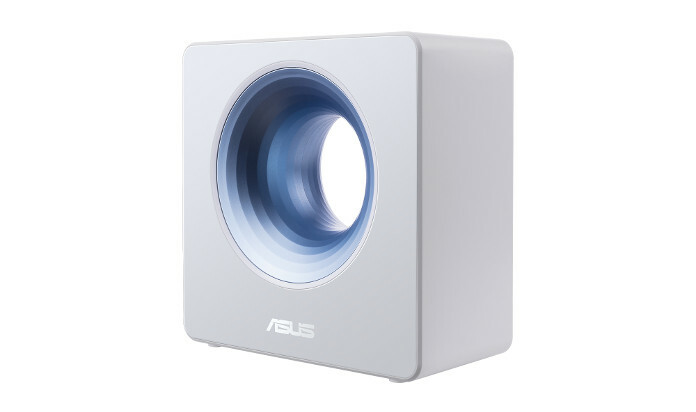 Devices with a particularly low SAF provoke interesting statements like “you are not putting that thing in the living room, period.” ASUS designed the Blue Cave to blend right in with your decor. It’s a router that plays the part without giving itself away. The Blue Cave’s design is simple and modern: a white square with a metallic blue hole, making for an object that’ll blend into any spot in your home. ASUS engineers worked hard to make all the necessary antennas fit and work inside the casing, and they came up with a dual-band 4×4 layout with MIMO support that’s capable of pushing an aggregate 2600 Mbps. Around the back, there are four Gigabit Ethernet ports for clients and a USB port for easily sharing a connected drive. You needn’t worry about overloading the Blue Cave with devices, either, as it’s powered by a dual-core Intel CPU for good measure. Additionally, the Blue Cave has support for AiMesh for easily extending WiFi range across your home, and the companion mobile app makes for easy setup and monitoring. ASUS’s AiProtection suite ensures safe internet browsing for everyone, too. Read all about Blue Cave in our hands-on article. The Blue Cave is priced at $179 USD and $239.99 CAD. Check the table below for etailers stocking this stunning router. .